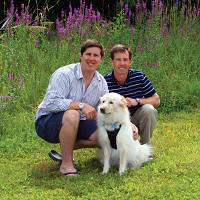 Brothers Kitter and Gordie Spater of Massachusetts love their dogs and wouldn’t dream of taking a road trip without their four legged friends along for the ride. But when Kitter adopted an energetic 70 lb. pooch named Zelda, car rides took a turn for the rambunctious and the idea to create safe, affordable pet travel solutions was born. The Kurgo Wander Hammock is designed to keep your canine co-pilot comfortably cradled in the back seat out of harm's way. It also doubles as a seat cover to protect your car from dirty paws. No more skidding onto the floor when the car stops short. For those looking for even more security, there’s the Tru-Fit Enhanced Strength Harness. This crash-tested product is like a seat belt for your dog and can be used alone or in conjunction with the Wander Hammock. In the event of an accident, having your pup buckled up can lower the risk of injury to passengers of both the human and canine variety. The car isn’t the only place that Kurgo products come in handy. Take the Quantum Leash, for example. Fully extended, it is 6 feet long, but transforms into a 3 foot training leash with the simple click of a carabineer. The Quantum can be worn around your waist or positioned across your shoulders for hands-free convenience, and can even be turned into a double dog walker. The padded handle is comfortable any which way you use it. By foot or by car, our testers give Kurgo four paws up. Hi Everyone, I'm Kitter, the co-founder of Kurgo Products. I am the designer and inventor of most of our products. Our mission is to help people get out and enjoy the world with their dogs. Our products are everything you need to safely and conveniently travel with your pup. Please feel free to ask me any questions! @Kitter can the storage bag be moved from hanging on the seat? Is it just there for the picture? @Patty Hi Patty, The hammock ships in the storage bag and the bag can be used where ever you would like. It is great for storing road treats and supplies. Wondering if you have considered adding another size, XL, for dogs weighing 90-150 pounds? @Kc Hello KC, We do have an extra large harness but you will have to check availability on the Grommet site. The XL fits from 80+ pounds. This is so cool. Love the thought that went into creating your products. I have a lab, bluetick coonhound pup that is growing quite rapidly so I'm not sure how large she will be. I am VERY interested in your harness and hammock but don't want to get them just yet again, because I'm not sure how large she will grow to be. @Mary Hi Mary. I would suspect that your dog when full grown will fit nicely into the large. How big is he now? @Kitter - do the hammock and the harness go together or does the hammock allow the dog to go from window to window? love these products! @Michele Hello Michele. The Hammock and harness can be used together or independently. @ANDREA Hi Andrea, Unfortunately I work for Kurgo, just the maker of the products so I'm unsure of the shipping issue. I did try going through the cart myself and had the same warning for 01952. I'm having my sales team reach out to the Grommet to come up with an answer. Stay patient and sorry for the inconvenience. @ANDREA Should be fixed now. I have a small dog who weighs about 14 lbs. Will it be possible to jump over the hammock to still attempt to climb into the front seat? @Tirani Hi Tirani, The hammock works well to keep "honest dogs honest" but if your dog wants to jump over the top I would think they probably can. The hammock works great to keep dogs off of the armrest and creates a barrier to make getting in the front less obvious. 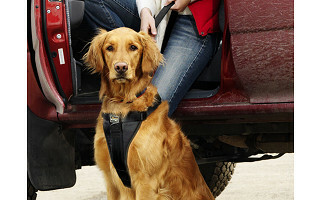 The harness is a great way to make sure that the dogs movement is restricted. @Kitter Hello--could you tell me, with the harness attached will the dog be able to lay down and or move around or does it hold them taught? @Jessica hello Jessica, The movement of your dog will be restricted but they should be able to lay down. @Kitter Kit the hammock takes up the entire back seat correct? No way to have a passenger back there as well? @Tirani Hello Tirani, The hammock has a split zipper which allows half of it to be zipped down so a passenger can sit comfortable in the back. @Kitter Hi Kitter. It appears the hammock takes up the entire back seat allowing no room for a passenger back there. Am I correct. On the few long trips we've been on my daughter rides in the back with her dog. @Tirani Dear Tirani, the hammock covers the whole seat but it can be zipped in half so the seat is still covered but a passenger can sit in the back. Can the harsh wth tether be used with the hammock? @Lynn Hi Lynn, The Harness and Hammock can be used together. The hammock is designed to allow access to the seat belts, so the tether can be attached to the seat belts through the hammock seat belt slots. The hammock can also be used with kids car seats, which is great b/c as we all know kids will spill milk, drop smart food and generally make a mess of a car, the newer the worse the mess. @kitter, I would like to order the hammock and harness, but when I attempt that, it says "This item is unavailable for delivery to your shipping address." Very unusual since I live in the continental US - zip 35405. @L Michael Hello Michael, Unfortunately I work for Kurgo, just the maker of the products so I'm unsure of the shipping issue. I did try going through the cart myself and had the same warning for 01952. I'm having my sales team reach out to the Grommet to come up with an answer. Stay patient and sorry for the inconvenience. @Kitter Should be fixed now. These products look wonderful. But I'm always looking to buy something that is Made In America. @Dixie Hello Dixie, Can't argue with that. All I can say is that I employ 15 people in Boston and we make a great product and I care a lot about pets, my customer and the people I work with. How long is the seat belt tether? Can it be used with the hammock? @Phil Hi Phil, The tether is 12" long and is attached directly to the seat belt. The Hammock is designed to the seat belts can be used. So the harness and hammock go very well together. Apologies for any issues with shipping at the moment - looks like a minor error on our end that we're fixing as we speak. Our Customer Experience Team is eager to help anyone who's having issues with shipping or zip codes. Please send an email to [email protected] and you will get a response shortly. @Nancy Hi Nancy. Kurgo does manufacture an XL harness that would work but you will have to check with Grommet and the availability. @Elizabeth hello elizabeth, great question. By unzipping the center one side of the hammock can be let down so a person could sit in the back. I have two questions regarding the harness. I have a very small silky terrier who is only 20 lbs. and wonder if the small harness would be too large. Also, how does it attach to the dog-because my Zoe ,who will be four, still wiggles when it is time for me to put her harness on. @Claire Hello Claire, The small harness should be a great fit for the silk terrier. There is a steel d-ring on the back of the harness that the seatbelt tether attaches to. dogs to get correct harness size? They are both larger than breed standard. Is it possible to stow gear in the back seat footwells when using the sling? Can the harness be used for field roading? Hi Kitter, is there a way for you to illustrate for us how the harness attaches to the seat belt? An illustration of the hammock and the harness in use together would help me see if this is going to work in my car. I have a standard poodle so he has a small neck and larger chest. He weights 55 pounds and I am leaning towards the large , his neck is 15 and chest 27. Does large sound right? Have anything for helping a lame dog in and out of a car? Kitter, is there some way to keep the dogs from slipping out of the sides? I have a cheap hammock now and one of my dogs has figured out how to slip out of the side and get in the front seat. Does this come in a size for a mini cooper? Brothers Kitter and Gordie Spater of Massachusetts love their dogs and wouldn’t dream of taking a road trip without their four legged friends along for the ride. But when Kitter adopted an energetic 70 lb. pooch named Zelda, car rides took a turn for the rambunctious and the idea to create safe, affordable pet travel solutions was born. The Kurgo Wander Hammock is designed to keep your canine co-pilot comfortably cradled in the back seat out of harm's way. It also doubles as a seat cover to protect your car from dirty paws. No more skidding onto the floor when the car stops short. 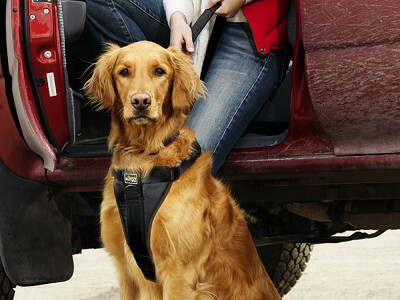 For those looking for even more security, there’s the Tru-Fit Enhanced Strength Harness. This crash-tested product is like a seat belt for your dog and can be used alone or in conjunction with the Wander Hammock. In the event of an accident, having your pup buckled up can lower the risk of injury to passengers of both the human and canine variety. The car isn’t the only place that Kurgo products come in handy. Take the Quantum Leash, for example. Fully extended, it is 6 feet long, but transforms into a 3 foot training leash with the simple click of a carabineer. The Quantum can be worn around your waist or positioned across your shoulders for hands-free convenience, and can even be turned into a double dog walker. The padded handle is comfortable any which way you use it.